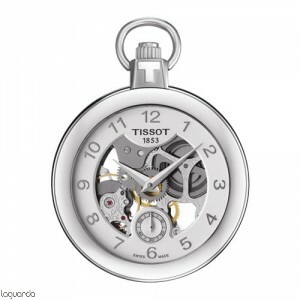 Tissot began creating pocket watches in 1853 and still continues to do so. They are not only a demonstration of the excellent expertise of the brand, but also the accumulated knowledge thanks to his experience. Today these watches are exceptional accessories and gifts that are characterized by their distinction. Tissot offers magnificent pocket watches demonstrating crafts used at the time, providing a mixture of nostalgia while modernity. There are many details and models available to suit individual personalities. Consult Jewelry Laguarda, our professionals advise them on-line sale with the possibility of express shipping.